Reliability starts at the top. Most homeowners at one time or another will have to replace the roof on their home. When they do, they may feel overwhelmed by all of the choices that they have. They will hear about 20 year roofs, 30 year roofs and lifetime roofing options. There are different materials that can be chosen that include fiberglass shingles, asphalt shingles, metal roofs and much more. A roof can be a big investment in the home. Making the right decision is very important. A homeowner should consider several things when choosing the type of roof they are going to put on their home. The climate of the area where the home is located will play an important role. The location may also impact the availability of different types of roof products. If a home is in an area where hurricanes and other natural disasters are prevalent, it may be necessary to get a more durable roofing product. Slate shingles and metal roofs offer better resistance to wind than an asphalt shingle does. Anyone that lives in an area where wildfires are a danger would want to avoid the wood shingle roofs due to their low resistance to fire. When talking about the shape of the roof, the slope and the angles are considered. Plastic polymer shingles are best suited for roofs that have a moderate to steep slope. Clay tiles are harder to cut and may not be good for roofs that have a lot of angles and difficult to cover places on them. Asphalt shingles are a versatile material that can be used with almost any roof that has a slope. Flat roofs require a different type of product and cannot rely on shingles at all. Because of all of the factors involved in making a decision about what type of roof is right for your home, it is best to consult with a professional to see what they offer. In addition to the factors above, it may be necessary to consider environmental concerns, look and other things to make the best decision. The design and style of your home will have a large impact on the type of roof style that will look the best. Roofing can make a big difference in how your home looks. Consulting with an architect or a home designer will help you to make decisions such as how steep your roof will be, as well as what type of style is best. For most people the choice of roofing material starts and ends with how much it will cost. They will look for the cheapest option. A new roof is a big investment, but it is better to look at the long term costs instead of how much it will cost at the time of purchase. In order to do that a person must look at how long the roof will last, how long they will live under that roof and other costs such as the utility costs of the home. The cheapest option is an asphalt shingle roof. At around $75 a square that is much lower than a slate roof that can cost over $1000 a square. When you compare the cost over the lifetime of these two roofs, the slate will cost around $10 a year and the asphalt will cost around $4 a year. The difference is not as large when comparing the costs over the life of the roof because of the number of years the different roofs last. The problem with a roof that lasts longer is a homeowner may not be in the home long enough to enjoy the savings. The average cost to replace a roof will differ with the types of materials used, the professional quote, and the overall pitch of the roof. With a flat roof the cost might not be as high as a roof that has several different sections and pitches. The most expensive are the wood shingles, cedar shakes, and clay roof tiles. However, when you pay for premium roofing materials you are also paying for a longer life span. The replacement or repair of an asphalt roof could be as early as five to six years. With roofs that have other more expensive materials on them, they may last up to 100 years if properly installed. What Homeowners Should Know About their Roof and the Roofing Materials? There are many types of roofing materials that are used in both residential and commercial areas. There are various ways to improve your home’s appearance or the curb appeal by updating the type of material that is used on the roof. However, when replacing a roof for the sake of appearance there are some other criteria’s that should influence your choice of materials. The Steepness of the roof or the pitch can limit the choices of roofing material that can be used on your home. This can also be referred to as the slope of the roof. The slope of a home can help or prevent rainwater from draining at a certain speed. It can also cause early repairs as soon as five to six years. If the slope of your roof is level, or flat, chances are there are spots on your roof where water likes to gather. Rain water can run off faster on a roof that is steeper. If the roof is level, there are special waterproof materials that can be used on the roof before the shingles or other roofing materials are laid. Normally, specialized roof covers require the hands on experience from a professional. Therefore, when attempting to repair a level leaky roof or apply a covering to prevent water from standing, it is ideal to contact a professional. The type of materials used on the roof is not only decided on by the homeowner, but also the pitch of the roof. If the roof is level, some types of roofing materials such as asphalt shingles might not be the best type to use upon replacement. Metal roofing materials have been commonly used on roofs that are not as steep as others. The indentions in the metal roofing materials allow rainwater will trickle off of the roof in sections instead of holding water in areas across the roof. To find the best materials for your roof, you first have to know the measurements of your roof. Common roofing materials normally are for roofs that have a four in 12 pitch. This means that for every 12 inches, the roof steeps four inches. 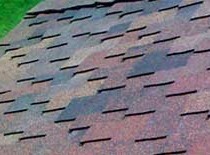 Asphalt shingles, wood shingles, cedar shakes, slate, and clay roof tiles all require a four in 12 pitch as a minimum. Different materials to think about include tile, wood shake, metal and shingles. Each of these materials may also have a variety of colors and styles available to choose from. After you consider all of the options available, seeking the advise of a designer or expert can help you choose the best option for you home. Texas has extreme weather patterns. Extreme weather requires extreme protection for your home. You don’t want to have a house made of straw when the big bad wolf huffs and puffs and blows your house down, otherwise you may end up staying with your relatives that have the brick house with a metal roof. Steel roofing is the best choice for high winds. Mechanically fastened sheet or shingle metal roofing can stand up to 140 miles per hour winds. That’s equal to a Category 4 hurricane. In addition to being protective, metal roofing lasts two times as long as a roof with asphalt shingles. Six manufacturers produce over 200 types of metal shingles that carry either a UL 2390 Class H or an ASTM D3161 Class F rating. Of course, this type of protection isn’t cheap. A metal roof can cost three to four times as much as a roof coated with asphalt shingles. However, when you think of the vastly superior protection offered by the metal roofing, it’s worth the extra expense. Plus, metal roofs look terrific. While the metal shingles are able to withstand 140 mph winds, unless they’re installed properly, all bets are off. That’s why you need to have your metal roof installed by Texas Star Roofing. We know the right way to apply the metal sheets or shingles, and we stand behind our work 100 percent. The main reason roofs fail is due to faulty workmanship. You’ll never have that problem with us. We’ve been protecting homes and families with metal roofing since 1997, and our technicians are experienced professionals, so you know that we can be trusted to give you five star service. Don’t trust your most valuable possession to a novice. Your home is your castle, and Texas weather tries to storm the gates every year. We’ll make sure your roof is secure and ready for everything Mother Nature can throw at it. We’re also available to repair your roof if it was damaged by a hailstorm or severe winds. Having a new roof installed on your home is a pretty big deal. It’s a big project and a big investment. Obtaining a warranty for your roof can help protect you from manufacturer defects. Additional warranty coverage can also be obtained to cover workmanship. A new roof should last for several decades, if not longer, and the chances that you’ll experience any serious problems are minimal, but roof repair and roof replacement costs are such that having a warranty on both the labor and materials is a good idea. Most roof warranties will cover the roofing materials for up to 20 years. The warranty may protect the homeowner from defective materials and cover their replacement costs. However, a warranty may not cover the labor costs associated with their replacement. Obtaining a workmanship warranty from the roofing contractor will help protect you in the event that a problem occurs due to contractor error and not a defect in the shingles or tiles. Some contractors will guarantee their work for up to 10 years. A manufacturer’s warranty on a roof will generally be for a period of between 20 and 25 years. The length of the warranty can also depend on the type of materials used in the roof’s construction. Asphalt shingles are a very common material used in roofing. They are inexpensive and easy to install, however, they typically will not last as long as a more durable material like slate. An asphalt or composite roofing material may come with a 25 year warranty while it may be possible to obtain a warranty of up to 50 years for slate. As with anything involving your home, or any contract you enter, read the fine print. Educate yourself on the limitations that may be stipulated within the warranty. Some warranties may not guarantee replacement costs due to leaks, but may only offer to repair existing materials. You can always count on Texas Star’s professional roofers for an honest (and free) inspection of your roof. ©2019 Texas Star Roofing Inc. Do Not Copy.